Visit Fairfax will be joining Virginia Tourism Corporation in celebrating the 50th Anniversary of their iconic “Virginia is for Lovers” brand this summer. 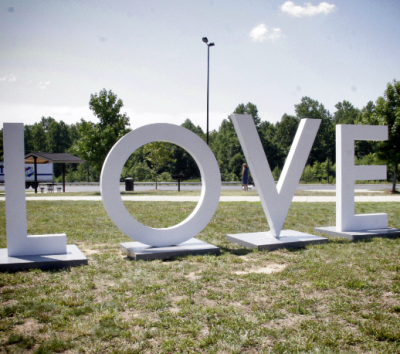 During National Travel & Tourism Week, we will be debuting Fairfax County’s first permanent LOVE sign at Tysons Corner Center Plaza on May 9. The sign will then go on an 11-stop tour around Fairfax County before being installed at the Workhouse Arts Center. Read the full press release below. Fairfax County, VA – (April 4, 2019) – Visit Fairfax, Fairfax County’s official tourism organization, announced today that it has received a $10,000 grant from the Virginia Tourism Corporation (VTC) “50 Years of Love” grant fund and will use the funds to celebrate the 50th anniversary of the iconic “Virginia is for Lovers” tourism slogan with a special activation this summer. In celebration of this golden anniversary, Visit Fairfax has partnered with the Fairfax County tourism community to welcome its first-ever permanent “LOVEwork” sign to the destination in a way that honors the spirit of travel. The iconic Virginia LOVE letters will make their debut on The Plaza at Tysons Corner during National Travel and Tourism Week, a time to celebrate the impact of tourism and the benefit of travel. Throughout the summer of 2019, the mobile “LOVEwork” will travel around Fairfax County to various attractions, representing the eclectic visitor experiences within the destination, before finding a permanent home at the Workhouse Arts Center in Lorton. The letters will be creatively “bedazzled” by several of the artists-in-residence at the Workhouse Arts Center, making the new Fairfax County “LOVEwork” sign a unique piece of art that visitors will enjoy for years to come. “50 Years of Love” is part of VTC’s efforts to celebrate the 50th anniversary of its long-running slogan, which was created in 1969 by Richmond-based advertising agency Martin & Woltz. In total, VTC awarded $300,000 to 30 tourism marketing programs across the Commonwealth to help increase visitation and revenue. Each grant recipient received $10,000 for this project, with the requirement of engaging 10 or more tourism partners. The Virginia Tourism Corporation is the state agency responsible for marketing Virginia to visitors and promoting the “Virginia is for Lovers” brand, which is celebrating 50 years in 2019. Tourism is an instant revenue generator in Virginia. In Fairfax County alone, the tourism industry contributes over $3 billion to the economy. In 2017, visitors to Virginia spent $25 billion, which supported 232,000 jobs and contributed $1.73 billion in state and local taxes. More information about the summer “LOVEwork” locations and dates, as well as other exciting tie-ins, will be posted on http://www.fxva.com/love. For more information about VTC’s “50 Years of Love,” please visit https://www.vatc.org/50YEARSOFLOVE. 50 years after its creation, “Virginia is for Lovers” continues to be one of the most recognizable and iconic tourism slogans of all time. "Virginia is for Lovers" was inducted into the Madison Avenue Advertising Walk of Fame on September 21, 2009. The slogan was included in the Advertising Icon Museum alongside fellow 2009 inductees, the AOL Running Man, the Budweiser Clydesdales, and State Farm&apos;s "Like a Good Neighbor, State Farm is There." This recognition came on the heels of Forbes.com tapping "Virginia is for Lovers" as one of the top ten tourism marketing campaigns of all time. Today, a new generation is discovering love for Virginia’s mountains, beaches, history, theme parks, vibrant cities, outdoor activities, sports and hospitality.